paulb triaged this task as High priority. It is important, however, to be true-to-life: there really is lack of developer effort, so no exaggerating, no past one-line-of-code contributors etc. We should be open about it and call the wide community for help. Yes, sounds reasonable... Shall I assign this to you, @IlyaBizyaev, at least for the time being? Can you get this started? I hope so... It may be not the best time for me right now, but I'll be able to get this started. Great. I am here too, so if you need any grunt-work done, just shout. Also, don't be afraid to recruit more people if you need them. Just started a poll, it got widespread quickly. Hoping to get a lot of feedback. Wow! Great job. That is what I call efficiency. 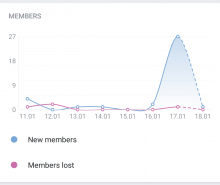 In a day, the post on the Russian community page has collected 300 votes. What is your attitude to Plasma Mobile? Also, a @vote bot in Telegram was used. People clearly lack information, which is on its own a reason for this campaign. 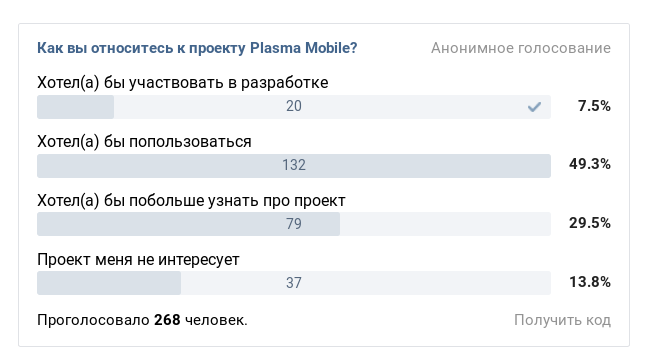 More than a half of poll participants want to try Plasma Mobile. While it's generally good, we clearly cannot provide this opportunity yet as PM is not supported by a wide range of devices and we haven't yet collected a list of supported ones. Also, the emulator is currently not end-user friendly and has problems that can make the wrong opinion of the project. 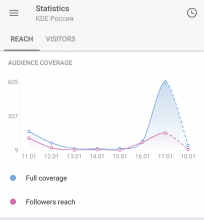 Even though the percentage of potential contributors is the lowest of all options, 26 people is a very good result for a community mostly consisting of users; if all those people could be onboarded and guided, that would be a huge progress already. Yeah, I'm getting similar results from Twitter and G+. Plasma Mobile is something our community (and beyond) feel strongly about and want. We (as in the promo team) should ask the devs to build an ISO, VM or something users can download and try on their desktop. We should write or help write an easy to follow, step by step tutorial for said image. 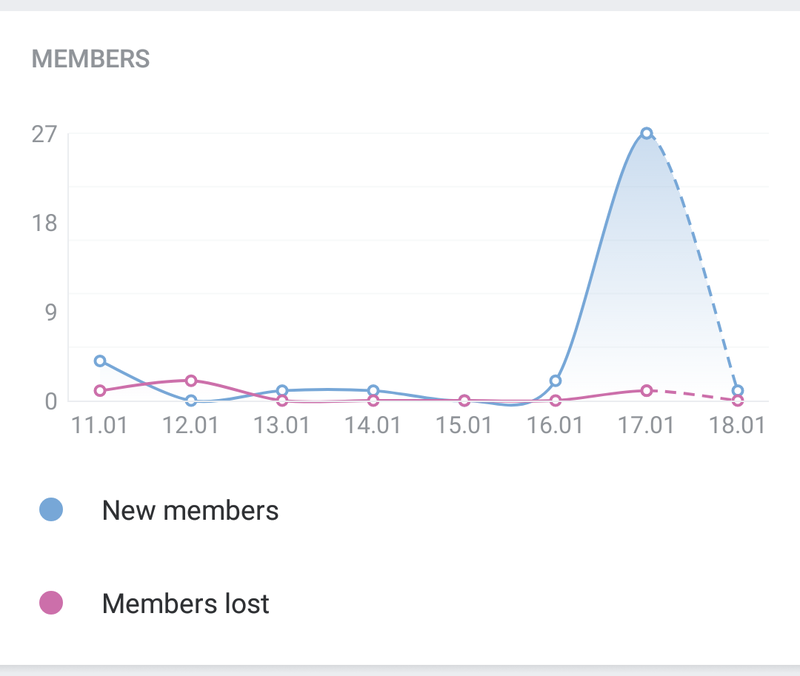 We should help users give the devs feedback in and orderly manner (i.e. : using the bugtracker). 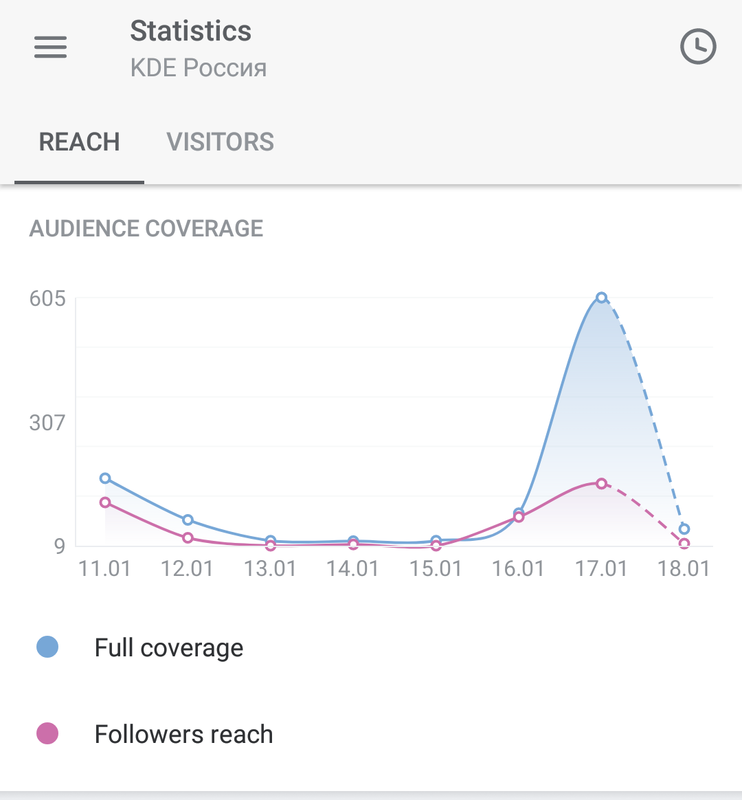 We should work on helping potential contributors become active contributors. We should be very careful and clear and explain that these are early days! Users are NOT going to be able to ditch the Android on the S8s and start using PlaMo. I would say this up next. Can we start this discussion? For lack of knowing any better, I agree with @IlyaBizyaev's definition of "Plasma Mobile". Anybody else got feedback on this? For me, "Plasma Mobile" in the strict sense is a Plasma shell optimised for touch input. That's what the name implies, after all. Basically I see it as the successor to Plasma Active and the overall concept of Plasma adapting to one's hardware dynamically. Obviously for it to be useful there need to be other utilities that are touch optimised as well, but that's Plasma Mobile only in the loose sense (and actually KDE Applications). I find the other things (Kirigami etc.) to be their own projects that integrate well with the shell. And indeed I'd say the most important task is packaging. The website of Plasma Mobile links to amd64 builds that are thoroughly obsolete. Ideally, Plasma Mobile should be a single apt-get/zypper install/etc. away, just like Plasma Desktop is. For instance, there's been a long-standing Gentoo bug about packaging it and nobody apart from me seems to take it up (potentially because it's not clear how it is supposed to be packaged). And while it's undestandable that ARM is a major target for Plasma Mobile, amd64 is a low-hanging fruit that should not be ignored. There are real nice Intel tablets nowadays. I looked at how some other mobile-oriented Linux projects work (Sailfish OS, Chromium), and one thing that was always annoying is that installation instructions always assume ARM and include a lot of unnecessary hardware abstraction/kernel/flashing steps that are simply a non-issue on amd64. I hope Plasma Mobile can avoid that and make installation for amd64 users a breeze. Note that we have already packaged Plasma Mobile for postmarketOS. This already made it possible to run Plasma on whole bunch of new devices (in this list basically every device with a working screen). Besides making it really easy to install it on your phone (as long as it's supported), it also makes Plasma Mobile a "apk add postmarketos-ui-plasma-mobile" away from a regular Alpine Linux installation if our repo is being used. Obviously not many people use Alpine on their computers, but it's a start. postmarketOS also provides a relatively straight forward Qemu VM to use. I also maintain a Gentoo overlay so I could take a shot at packaging it there as well. Sweet. I actually have a slightly more updated ebuild for plasma-mobile, as well as an ebuild for plasma-phone-components, that's not posted on the Gentoo bug tracker yet, I should probably upload that. I am in fact succesfully running Plasma Mobile on my tablet already. It's far from being ready for daily use, of course, but the basics work fine. Thanks @PureTryOut. Can you add links to packages and instructions to T7779? Ok, so with a lot of help from @bshah, we have the following data. Plasma Mobile and Plasma Phone are two different things that are often confused: Plasma Phone is a phone shell, user interface, while Plasma Mobile is a common name for the stack (Qt/KDE parts: Plasma, frameworks, applications). Halium is not included in this stack, which is reasonable as Plasma Mobile can also work on top of postmarketOS and desktop distributions. CAF rootfs is used on Qualcomm devices which are using the kernel and binary blobs provided on CodeAurora Forum; for others, the generic is used. Any distribution packaging this can act as a base system for Plasma Mobile. Packaging these parts along with plasma-phone-components ensures a working Plasma Mobile system. Nowadays, most modern distributions provide these parts and should be able to package and run Plasma Mobile. Phone shell interface is in https://cgit.kde.org/plasma-phone-components.git/, maintained and developed mostly by Marco Martin. vPlayer 3rd party Kirigami interface by JBBgameich: https://github.com/JBBgameich/kirigami-videoplayer Interface needs to be upstreamed? Currently, mobile-specific development is only done by Bhushan Shah and Marco Martin! @bshah supports the idea of Plasma Mobile tasks being proposed to GSoC and promised to come up with important ones tomorrow. GSoC is a nice way to get work done, but for this to succeed, we need mentors. Perhaps for the camera, we could use Kamoso? It uses Kirigami and is developed by @apol, who does Discover. What is offered at the moment is purely arbitrary, we should make sure that any application that is available on Neon is available on the phone. I also think about apps that do not target Android but would fit well on mobile, e.g. KTimer. In my opinion, packaging all apps that could run on Plasma Mobile for it would help raise community's internal interest and also showcase more projects to the public. @PureTryOut I copied a list of devices with screen working, where should we point testers for installation instructions? For completeness repeating what was said on Telegram, yes that installation guide will do. We also have https://wiki.postmarketos.org/wiki/Plasma_Mobile for Plasma Mobile specific, but the former will do nicely. I assume most people understand they need to choose "plasma-mobile" when promped for a UI choice.